Is the border fence finished? By on Tuesday, May 17th, 2011 at 10:41 a.m. 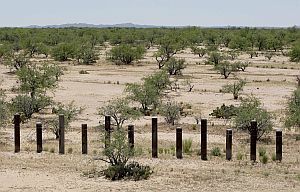 Sections of the fence on the Mexico border, like this one near San Miguel, Ariz., are designed primarily to stop vehicles. In his May 10 speech in El Paso on immigration reform, President Barack Obama declared that the fence along the border with Mexico is "now basically complete." Still, he predicted that many Republican opponents won't be satisfied until, he speculated, there’s a moat put in place too. Fencing along the U.S.-Mexico border has long been a hot topic, so with Obama effectively declaring "Mission Accomplished," PolitiFact checked his fence claim.